Biscotti Bari...Authentic Double Chocolate Espresso Biscotti, handmade, Italian style, small batch authentic double chocolate espresso biscotti, crafted with care the same way it is still done in Bari, Italy. Using only the finest locally sourced all-natural ingredients...authentic double chocolate espresso biscotti are made with freshly ground espresso & chocolate chunks. 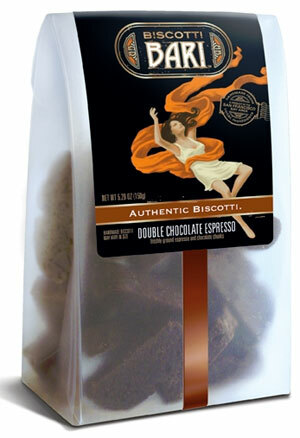 Biscotti Bari Authentic Double Chocolate Espresso Biscotti...truly a treat beyond compare!!! Stacey Bruno Migale, dedicated to quality, & with a love of baking is proud to support local farmers & businesses who are equally as dedicated to producing the highest quality products. Authentic Double Chocolate Espresso Biscotti / Biscotti Bari. Creatively packaged in a frosted bag with a hand-applied ribbon. Authentic Biscotti, Handmade in Sonoma, California.